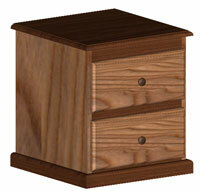 You can easily and quickly build this bedside night table and finish it to match your pre-existing bedroom furniture. Built from solid oak and oak veneer using simple joinery techniques, this piece of furniture will last for years to come. Of course, you may choose other wood species in order to match other furniture in the bedroom. The spacious, easy glide drawers are just perfect to store bedside knick knacks.